Next Giant Leap's lunar "hopper" also eschews wheels. 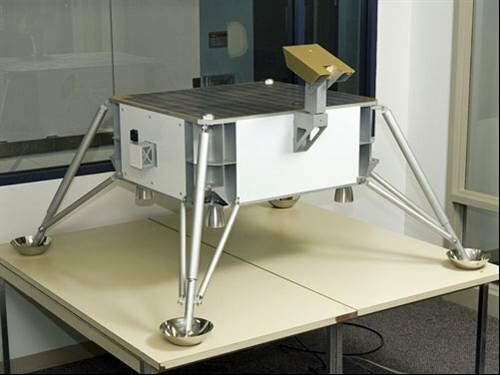 The team plan to have their lunar lander travel across the surface once it has touched down, using the same system of thrusters used to land. "If you have to develop the technology to land safely one time, it's not a big leap to do it again," says team leader Michael Joyce. They think hoppers will be a game-changer for exploring rocky, mountainous planets. "We can get to places a rover can't," says Seamus Tuohy, a team member and director of space systems at Draper Labs in Cambridge, Massachusetts. At Draper Labs, the team are working on a system to simulate lunar gravity for tests of the hopper's navigation and communication systems. It uses high-powered fans to lift five-sixths of the hopper's weight. More than a dozen teams are racing to claim the $30 million Lunar X Prize for landing a robot rover on the moon. This article first appeared on New Scientist.